An extraordinary wolf and her fight for survival in one of America’s last islands of wilderness. COST OF FREEDOM is the story of a wolf the feds named B36F. 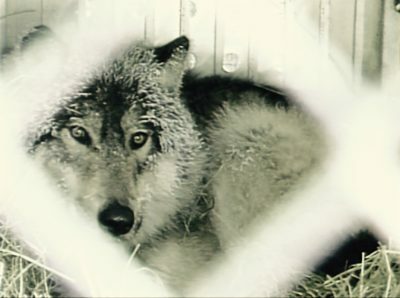 She was one of 66 wolves brought from Canada to the lower 48 states during the Wolf Reintroduction Program of 1995. While other wolves formed packs, B36 roamed the Idaho mountains alone. 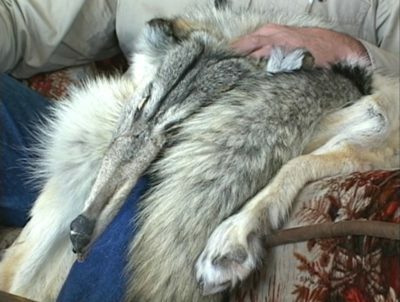 After several years, she found her mate—a native wolf that biologists called “The Old Man”—and gave birth to a litter of puppies that many people saw as an indication of the reintroduction experiment’s success. 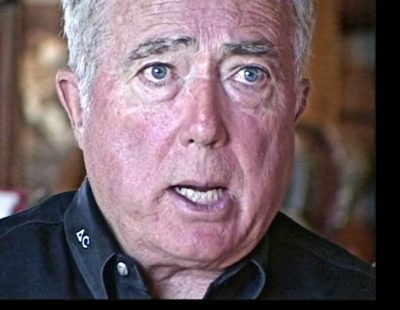 What followed would not only question that theory of success but expose the complicity of the US government in the subsidized destruction of the American west. Films often illicit a life/world of their own that I often find tangential, and even worthless. COST OF FREEDOM was superior; and so unexpected to have something taken so seriously and with such integrity amid rock climbing dogs and stealth trampoliners (not that these aren’t worth seeing). The context of the Banff festival was perfect – it confounded the effect your film had on viewers. The end of your film was the first time during the whole 2.5 hour event that stillness and silence were allowed to hover, even after it became somewhat uncomfortable. It moved me to think and believe that films like yours can change the world. The remarkable effect on viewers of Vanessa’s film has created a groundswell of public support for wolves and a changed public climate which has become much more supportive of legal actions like WWP’s to protect wovles and wildlife in general. I can say without reservation that her film has had a manifest and remarkably positive impact on public opinion and the political climate surrounding wolves in the west. Without Vanessa’s film COST OF FREEDOM, efforts like WWP’s to protect wolves would never have been able to make as much headway as we have. COST OF FREEDOM casts a harsh shadow on efforts to delist wolves from the Endangered Species rolls. Clearly, these animals need more protection, not less. Vanessa Schulz is a terrific filmmaker whose work makes us think and question, and ‘Cost of Freedom’ is yet another example of her talent, compassion and courage. Don’t miss it. I have no doubt that your film will leave a mark on everyone who sees it. Thank you for your courage in making and supporting this film. It takes a lot of conviction and energy, especially in the face of criticism. 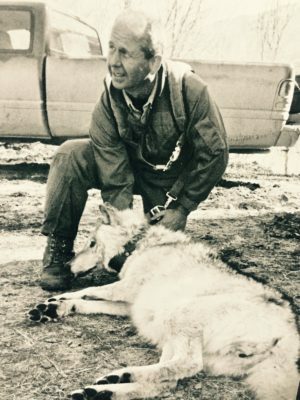 COST OF FREEDOM was crucial in the establishment of the Wolf Program. Without Vanessa’s diligence and superb filmmaking, I would not have been able to gain nearly the support that I needed to create this program. I owe a great deal of gratitude to her for her commitment and talent. I recently saw “Cost of Freedom” at the Banff Film festival here in Peterborough. I was enthralled! I teach an ecology unit in the grade 10 course and this video is an excellent resource! Thank you for spreading this important message! Yours is an extremely noble cause and even though noble causes don’t pay the bills they are good for the soul. In the long run it is the noble cause which is remembered. Vanessa Schulz is a terrific filmmaker whose work makes us think and question … “Cost of Freedom” is yet another example of her talent, compassion and courage. Don’t miss it! *Your tax-deductible donation will help Cost of Freedom educate a wider audience on the sentience of wolves. Through effective outreach, we hope to stop the hunting of wolves for sport. Karma—Wolves are killed so we can eat cows. 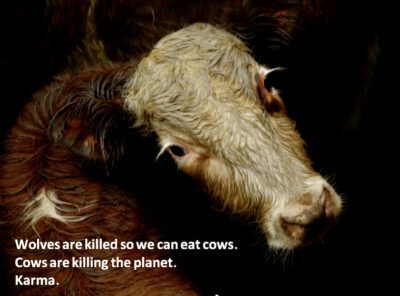 Cows are killing our planet. 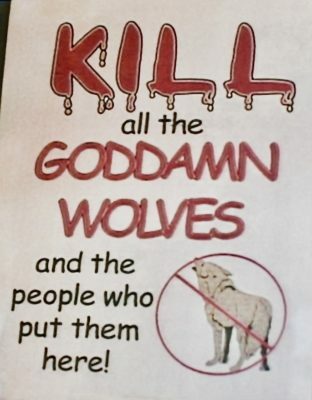 There is a war being waged on wolves. When Congress removed wolves in Montana and Idaho from Endangered Species protections in 2011, hunting quotas were set to give illusion of oversight. But when the quotas are not reached, the season is simply extended. 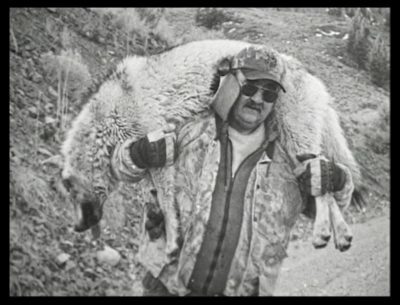 When the quotas are still not reached—because wolves do not in fact exist in the numbers claimed by the anti-wolf faction—then direct killing is ordered by air and ground attacks using helicopters, drones, ATVs and steel leg-hold traps. Idaho’s stated goal is reducing 750 wolves to less than 150—the 15-breeding-pair threshold where the federal government could consider restoring a moratorium. In Montana, hunters will be allowed to kill 40% of the state’s estimated 550 wolves. In Wyoming, 100 to 150 wolves near Yellowstone will be spared (100,000 people visit annually specifically to see wolves, generating over $35 million per year) while in the remaining 80% of the state, wolves are considered vermin and can be killed year-round. Roughly 60% of Wyoming’s 350 wolves will be targeted. With the propaganda machine already in full swing, the same atrocities could occur in Oregon. One of the most egregious assumptions that goes unquestioned is that trapping is an acceptable method of capture (not to mention the unquestioned assumption that wolves need to be captured/collared at all). 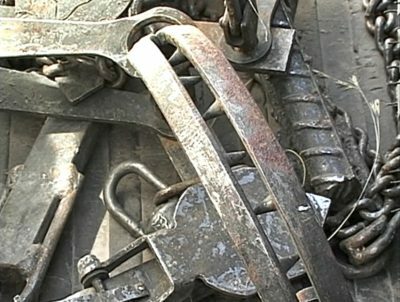 If wolves don’t chew off their legs to escape, then it is because these traps have been modified with a rod to keep the animal’s head in place, or steel teeth to prevent the animal from sawing off it’s own leg. Dislocated limbs, compound fractures, damaged teeth, impact on non-target species, psychic trauma, accidental deaths etc. are rarely mentioned. Traps are the most inhumane devices ever invented and banned in 80 countries. 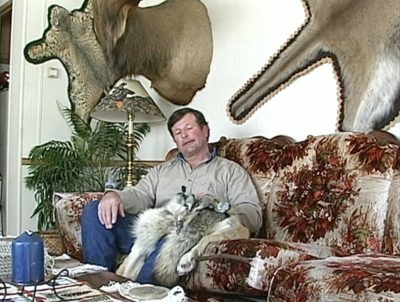 But in America, wolf trapping recently became legal as a “sport” citizens can enjoy, including strangling wolves with wire nooses. Rarely mentioned are the ethics of killing an animal so closely knit as a family—mother, father, brothers, sisters, uncles, aunts, cousins caring for children and grandchildren. Few people consider what it must feel like to be a wolf blown out of a grove of trees with cracker shells dropped from a helicopter, chased mile after mile as the gunman takes aim, shot, drugged, ear-tagged; waking up covered in the stench of man, a massive weight around her neck, alone in foreign territory, coming to the realization that her family are all gone. And we don’t mention the emotion for fear of appearing maudlin. Over time, even the government agents had to acknowledge the extraordinary benefits to the environment and other species of returning wolves as keystone predators—they evolved over millennia to positively benefit everything from trees to insects. But old habits die hard. Fear-mongering with catch phrases like “chronic depredation” and “problem wolves” continues in order to justify the government’s heavy-handed management of wolves and killing sprees which are nothing more than tax-payer funded hunting expeditions. The cost of a cow is between $1000 and $1,500. The cost of collaring and/or killing a wolf is the same price. These animals are captured multiple times and relocated, if they don’t die in the process from drug overdoses, misplaced darts, hemorrhaging or heart attacks. 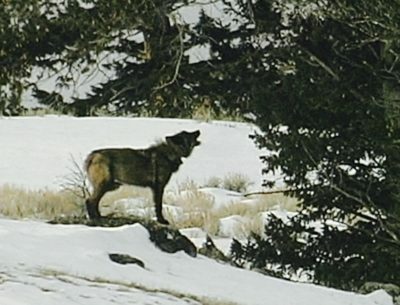 Government agents know that breaking up packs and relocating sub-adult wolves to unknown territories causes more cattle depredation. 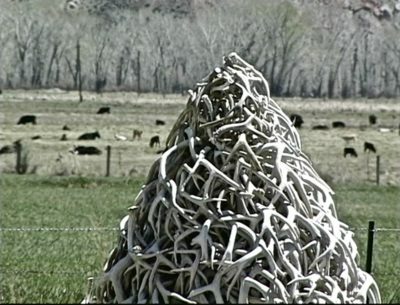 When you break up packs through relocation and/or killing, you’re left with unstable pack structure, immature wolves who have not yet learned to hunt, lone wolves who cannot take down wild game and are forced to go for the easiest prey available (cows and sheep). Or maybe they understand it perfectly and “wildlife management” is a self-perpetuating industry of control. A Department of Agriculture report shows that less than one quarter of one percent (0.23%) of the American cattle inventory is lost to native carnivores. This occurs in the following order: Coyotes, dogs, cougars, bobcats, lynx, “other,” vultures, wolves, bears. The real killers of cattle are illness, extreme weather and bad animal husbandry. While it might be more honest complaining about climate change, welfare ranchers profit far more through government subsidies and tax breaks by using wolves as scapegoats. The depredation spin facilitates the war on wolves. 80% of the public voted to bring them back. We need those people to protect them now that they’re here. One way to do that is NOT to notify US Fish & Wildlife if you’re lucky enough to see a wolf. Consider it a death sentence if you do. IF YOU SEE A WOLF, DON’T TELL ANYONE! 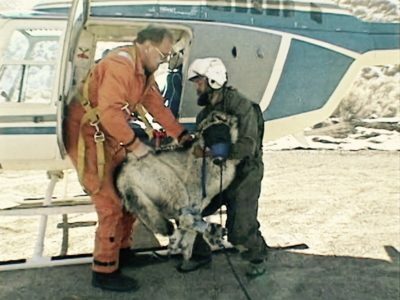 Another popular myth: People need to be protected from wolves. Consider the ratio of deaths—Between one and two million wolves killed… to two people. Your indoctrination does not bode well for wolves. With all due respect, you have an extraordinary opportunity to do things differently. Show Idaho, Wyoming and Montana that a humane policy is possible and let your powerful position as a wolf recovery leader in Oregon live up to it’s title by allowing wolves to truly recover under your protection. This could be your legacy and we, the public will stand behind you.